These wearable works of art were created by students at Miami International University of Art and Design. Fast food clothing is fashion’s latest trend: KFC gave this actually stylish line of limited-edition clothing line, McDonald’s created a Big Mac-themed line they’re giving away to customers who order through UberEATS, and their official line of surprisingly wearable merch for sale in Japan is a minimalist burger lover’s dream come true. 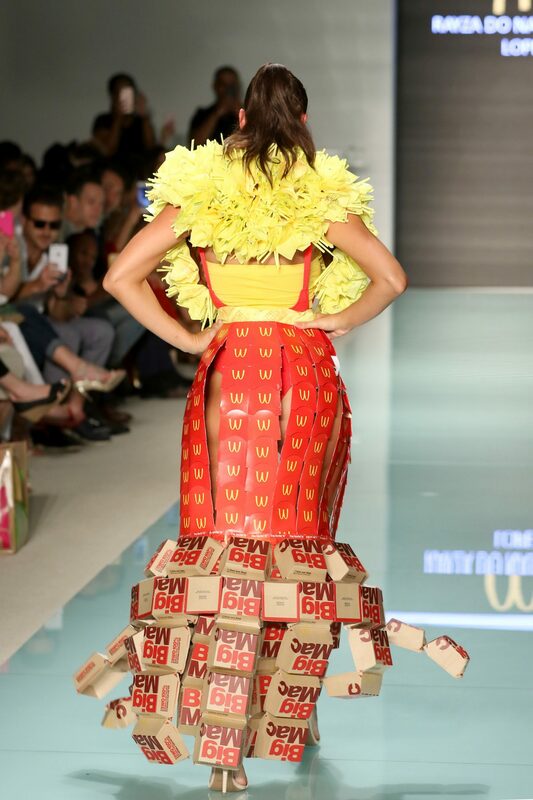 Now McDonald’s is getting a couture treatment: Students at the Miami International University of Art and Design used packaging from the fast food chain to create some impressive looks. A South Florida franchisee for the fast food chain asked the students to take on the challenge back in 2015, to truly magnificent results. 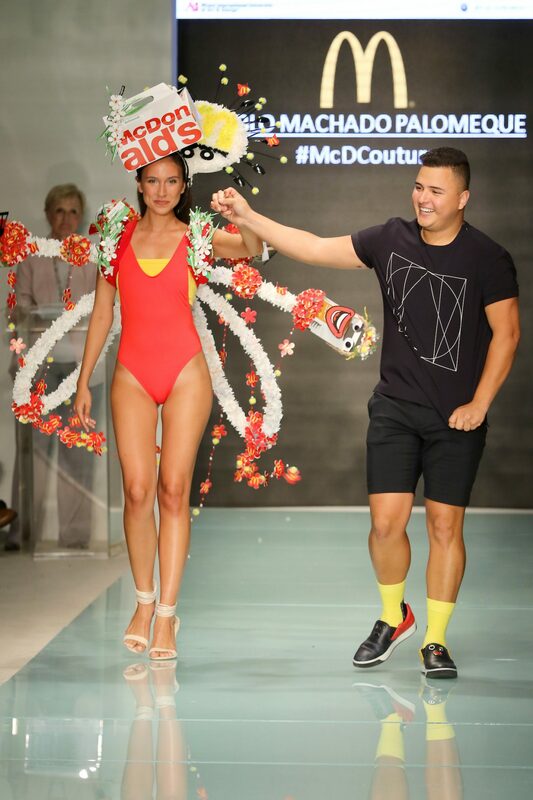 The designs, named the McDCouture Design Challenge , were shown as part of the Funkshion Fashion Week Miami Beach and Miami Swim Week at the Setai Hotel. The franchisee that suggested the collaboration, called Cabrera/Bentancourt, owns 20 McDonald’s locations, and is a long time partner of the university. 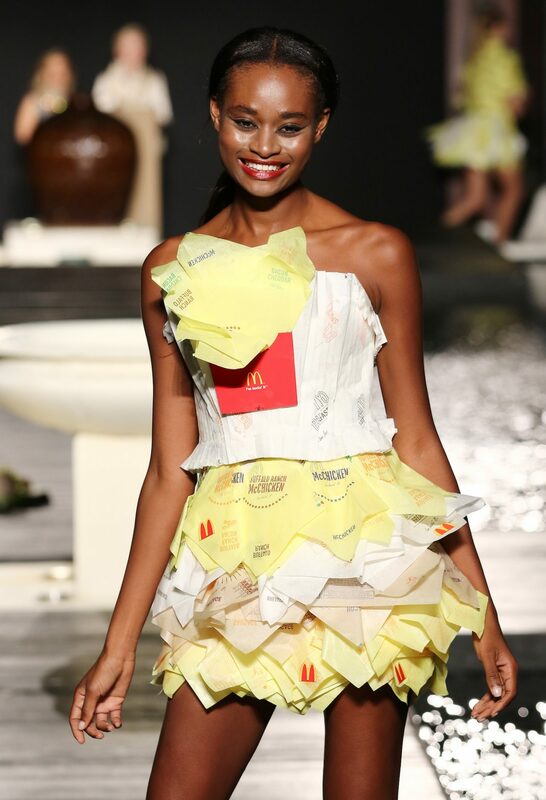 A panel of industry experts and McDonald’s franchise owners judged the collection of designs. Cabrera/Bentancourt awarded Pablo Machado Palomeque a $5,000 scholarship for his design, called “McDCouture Angel,” made from fry boxes cut into the shape of flowers and more than 7,000 “butterflies” made from sandwich wrappers. The final product is a set of red and white wings the model wore over a red bathing suit, along with a headpiece made out one of the chain’s paper bags. 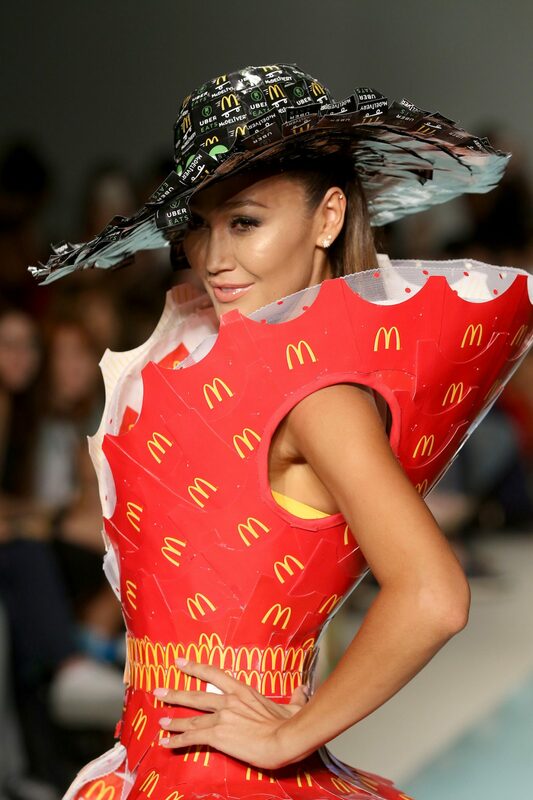 Palomeque also used soft baked cookie boxes, Filet-o-Fish boxes, burrito wrappers, apple pie boxes, happy meal boxes, and McFlurry wrappers, to bring his look to life. 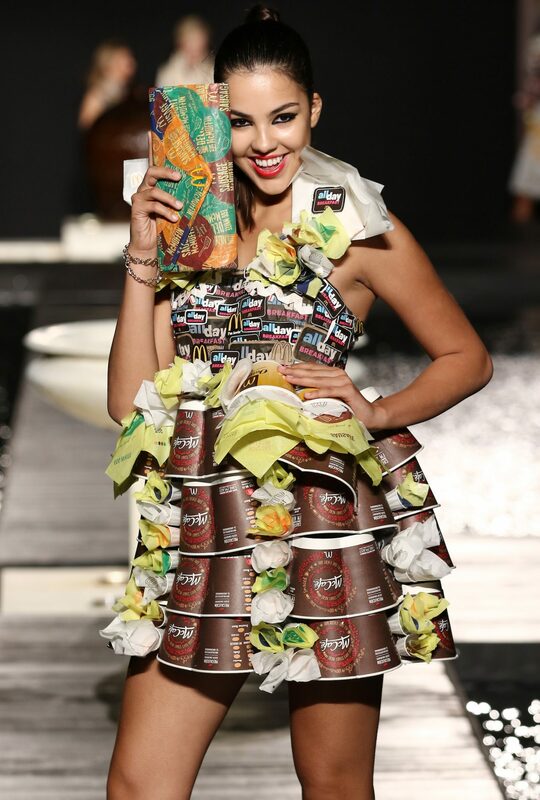 The creative project turned fast food into a fashion statement but it also brought home just how much paper and packaging the fast food company uses to store and deliver their menu items. 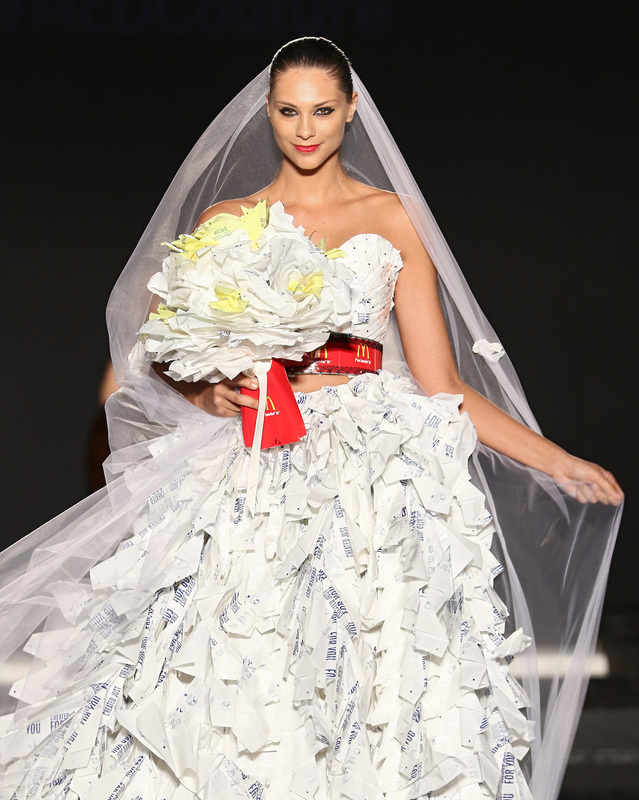 At least the designers were able to make that vast amount of paper look pretty. The whole McDCouture collection is now on display at Miami International University of Art and Design for the next month.